Using essentially the same type of imaging sensor found in digital cameras, astronomers have captured images of a planet outside our solar system for the first time. University of Arizona researchers snapped images of a planet outside our solar system with an Earth-based telescope using essentially the same type of imaging sensor found in digital cameras instead of an infrared detector. Although the technology still has a very long way to go, the accomplishment takes astronomers a small step closer to what will be needed to image earth-like planets around other stars. “This is an important next step in the search for exoplanets because imaging in visible light instead of infrared is what we likely have to do if we want to detect planets that might be suitable for harboring life,” said Jared Males, a NASA Sagan Fellow in the UA’s Department of Astronomy and Steward Observatory and lead author on a report to be published in The Astrophysical Journal. Even though the image was taken at a wavelength that is just shy of being visible to the human eye, the use of a digital camera-type imaging sensor – called a charge-coupled device or CCD – opens up the possibility of imaging planets in visible light, which has not been possible previously with Earth-based telescopes. 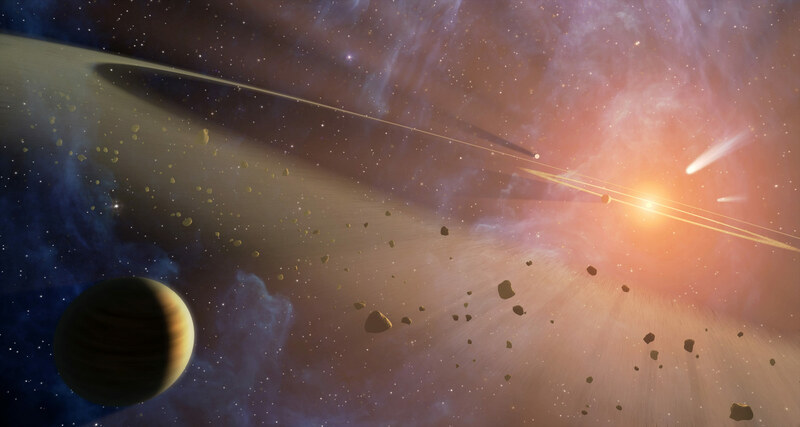 “This is exciting to astronomers because it means we now are a small step closer to being able to image planets outside our solar system in visible light,” said Laird Close, a professor in the Department of Astronomy, who co-authored the paper. He explained that all the other Earth-based images taken of exoplanets close to their stars are infrared images, which detect the planets’ heat. This limits the technology to Gas Giants – massive, hot planets young enough to still shed heat. In contrast, older, possibly habitable planets that have cooled since their formation don’t show up in infrared images as readily, and to image them, astronomers will have to rely on cameras capable of detecting visible light. The photographed planet, called Beta Pictoris b, orbits its star at only nine times the Earth-Sun distance, making its orbit smaller than Saturn’s. In the team’s CCD images, Beta Pictoris b appears about 100,000 times fainter than its host star, making it the faintest object imaged so far at such high contrast and at such relative proximity to its star. The new images of this planet helped confirm that its atmosphere is at a temperature of roughly 2600 degrees Fahrenheit (1700 Kelvin). 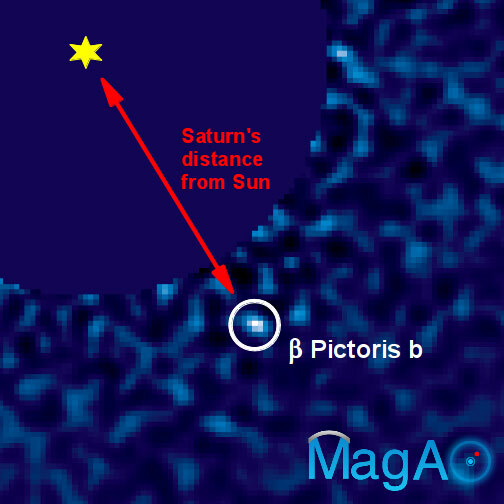 The team estimates that Beta Pictoris b weighs in at about 12 times the mass of Jupiter. The contrast in brightness between the bright star and the faint planet is similar to the height of a 4-inch molehill next to Mount Everest, Close explained. In addition to the host star’s overwhelming brightness, the astronomers had to overcome the turbulence in Earth’s atmosphere, which causes stars to twinkle and telescope images to blur. The success reported here is mostly due to an adaptive optics system developed by Close and his team that eliminates much of the atmosphere’s effect. The Magellan Adaptive Optics technology is very good at removing this turbulence, or blurring, by means of a deformable mirror changing shape 1,000 times each second in real time. Adaptive optics have been used for more than 20 years at observatories in Arizona, most recently at the Large Binocular Telescope, and the latest version has now been deployed in the high desert of Chile at the Magellan 6.5-meter telescope. The team also imaged the planet with both of MagAO’s cameras, giving the scientists two completely independent simultaneous images of the same object in infrared as well as bluer light to compare and contrast. Development of the MagAO system was made possible through the strong support of the National Science Foundation MRI, TSIP and ATI grant programs. The Magellan telescopes are operated by a partnership of the Carnegie institute, the University of Arizona, Harvard University, Massachusetts Institute of Technology and the University of Michigan. The work of NASA Sagan Fellows Jared Males and Katie Morzinski was performed in part under contract with the California Institute of Technology funded by NASA through the Sagan Fellowship Program executed by the NASA Exoplanet Science Institute. Be the first to comment on "Researchers Take an Important Step Toward Discovering Habitable Earths"